Bringing home a new kitten or puppy is such a fun time in your family! It’s a big change, and with all the excitement often comes stress. If you’re planning to add a tiny fur baby to your family, here are some tips for making it a happy homecoming. 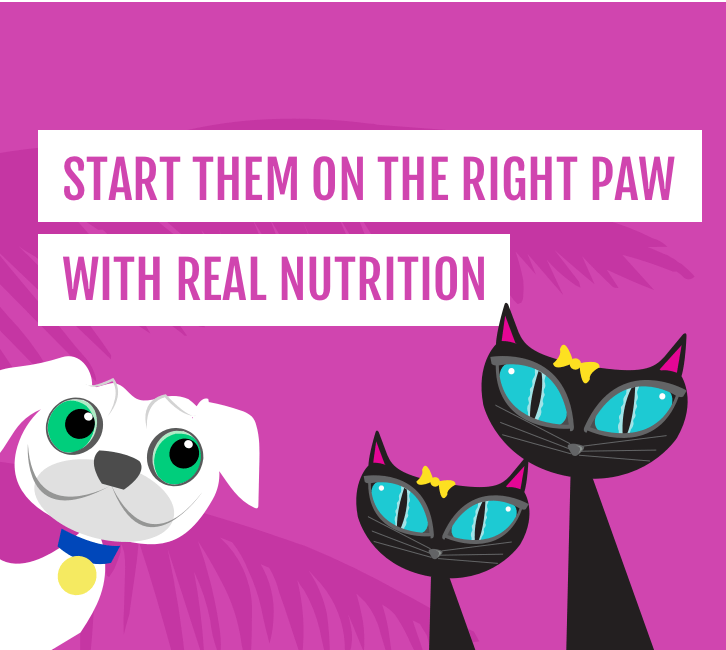 When choosing a food, look for one that’s designed for kittens and puppies’ unique nutritional needs. They should be high in protein and include DHA, an omega-3 fatty acid found in mother’s milk that helps with healthy brain and eye development. Depending on the puppy or kitten’s age, she might still be getting used to solid food. To make the transition from mother’s milk easier, you could try an easy-to-eat wet food, like Tiki Cat® Kitten Mousse and Tiki Dog™ Aloha Petites™ Puppy Mousse, either on its own or mixed into kibble. Next, it’s time to kitten-and-puppy-proof your home! Like toddlers, kittens and puppies are curious and full of energy, so they naturally get into everything. The best strategy is to get down on their level and crawl around your home to see where you might need to make adjustments. Move hazardous items, like cleaning solutions, dishwasher pods, sharp objects, small choking hazards and so on, out of your new pet’s reach. Put anything breakable or valuable away in a secure place. Keep in mind that cats are natural climbers, so placing items up high may not be safe enough. Choose a veterinarian, and schedule a check-up for the first week your puppy or kitten is home. Research how to care for a new puppy or kitten. Look for local obedience training classes for your puppy. Talk among your family members and make decisions ahead of time. Where will the puppy crate or litter box go? (Hint: pick a quiet, private place where they won’t be disturbed). Make a plan to introduce them to your existing pets. In this case, it’s helpful to choose a temporary room where your puppy or kitten can initially stay separate from other pets while exchanging scents. Also, determine who will be responsible for what. Feeding them, scooping the litter box, taking the puppy for walks…it’s best to set expectations and rules now to avoid arguments or forgetting later. Speaking of forgetting, did we forget anything? If you have any tips for bringing home a new puppy or kitten, please leave a comment below. And, don’t forget to share your #proudpetparent moments and photos on Facebook or Instagram #tikipets.